Dental Bonding is a restoration procedure in which a tooth-colored resin is bonded to a tooth and cured with ultraviolet light. Dental bonding is faster and cheaper than veneers or crowns, and can thus be a good option to make small cosmetic improvements to your teeth. Unlike veneers and crowns, bonding can be done within one office visit since nothing has to be custom made by a dental laboratory. Additionally, the procedure typically requires removing less the tooth enamel compared to veneers and crowns. 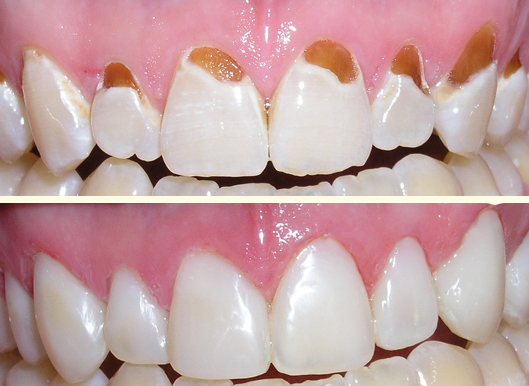 However, since teeth bonding typically doesn’t last as long as other forms of restoration and is less resistant to stains, it is used more often for small cosmetic touchups rather than major restorations. Dental bonding varies in cost depending on the severity of the problems encountered, however dental bonding is typically cheaper than the other alternatives including veneers and crowns. Kupchik Dental, serving West Nyack, New City, and the surrounding areas, offers affordable and professional dental bonding.